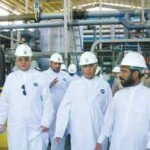 Saudi Arabia has pushed forward in its efforts to turn seawater into drinkable water, re-launching the world’s largest floating desalination plant, with another floating plant close behind. Each barge has a production capacity of 25,000 cubic meters a day. The first, originally deployed in 2008, was launched on Wednesday in Yanbu, a major Red Sea port in the Al Madinah Province of western Saudi Arabia. The gamble is that floating barges can come to the rescue of water-starved regions. The stakes are high, the costs are frequently prohibitive, the technology is controversial, the environmental impact is debatable and parched areas of the world, from California to Australia, are watching closely. “These two barges will contribute to meeting the increased demand for potable water in Madinah and Yanbu,” said Fehied F. Al-Shareef, the governor of the Saline Water Conversion Corporation (SWCC). Desalination is the process of purifying salt or brackish water into fresh water—until now more of a mirage than a reality for large-scale oprations. The technology has had modest successes, such as Santa Catalina Island off the coast of California, it is generally regarded as a last resort for generating fresh water. 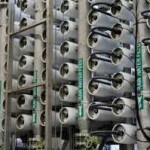 Even so, the cost of desalination has come down steadily, and it is becoming a more affordable means of meeting the world’s growing freshwater needs, according to a new report from Pike Research. Pike Research, which characterizes itself as a “cleantech market intelligence firm,” said it its study that global desalination investment will double from $8.3 billion in 2010 to $16.6 billion per year by 2016, representing cumulative spending of $87.8 billion during that period. Saudi Arabia is in no position to wait. The barges were first put into operation in 2008 to support increased requirements in the western region and were anchored on the coast of Shuaibah. In 2009 the barges moved to the shores of Shuqaiq City, making mobility one of the most important features of the barges. The debate over desalination is complex. On the one hand, proponents have proven that fresh water can, in fact, be created out of previously unconsumable water. On the other hand, the amount of energy required to run a desalination plant is formidable. In addition, pollution caused by the plant gives environmental watchdogs the jitters, not to mention the environmental impact of pulling seawater from the ocean and releasing brine, possibly harming sea life. However, new technologies to address these negative aspects of desalination are quickly making it a more attractive option to water-stressed areas. 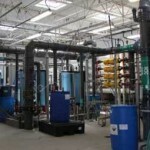 Using forward osmosis rather than reverse osmosis greatly reduces the energy requirement of a desalination plant to the point that renewable energy can be used to run it. Additionally, the design of a desalination plant itself, including where it pulls water and releases brine, can minimize its environmental impact. Israel is now desalinating water at a cost of $0.53 per cubic meter; Singapore is desalinating water for $0.49 per cubic meter. Many large coastal cities in developed countries are considering the feasibility of seawater desalination, due to its cost effectiveness compared with other water supply options, which can include mandatory installation of rainwater tanks or stormwater harvesting infrastructure. But it is in Saudi Arabia that the push has been the hardest and, arguably, the most creative. Such as putting desalination plants on barges, and steering them toward the places that need fresh water the most.